Quite obviously, the cast of what may be TV’s most spoiler-protected show ever wasn’t going to march out onto Comic-Con’s Hall H stage and start spilling secrets, especially in the absence of David Lynch. In fact, they couldn’t even if they wanted to—aside from perhaps MacLachlan, the actors are only allowed to read the pages of the script which contains dialogue for their characters. But though they may be just as perplexed as the audience by what exactly is happening on the show, they all had nothing but glowing words to share about Lynch and the Twin Peaks experience. In the panel hosted by Damon Lindelof (The Leftovers, Lost)—who credited his entire career to Twin Peaks, a show which affirmed to his teenage self that he wasn’t the only weirdo in the world—original series stars Kyle MacLachlan (Agent Dale Cooper), Everett McGill (“Big Ed” Hurley), James Marshall (James Hurley), Dana Ashbrook (Bobby Briggs), and Kimmy Robertson (Lucy Brennan) were joined by newcomers Naomi Watts (Janey-E Jones), Tim Roth (Hutch), Matthew Lillard (Bill Hastings), and Don Murray (Bushnell Mullins). 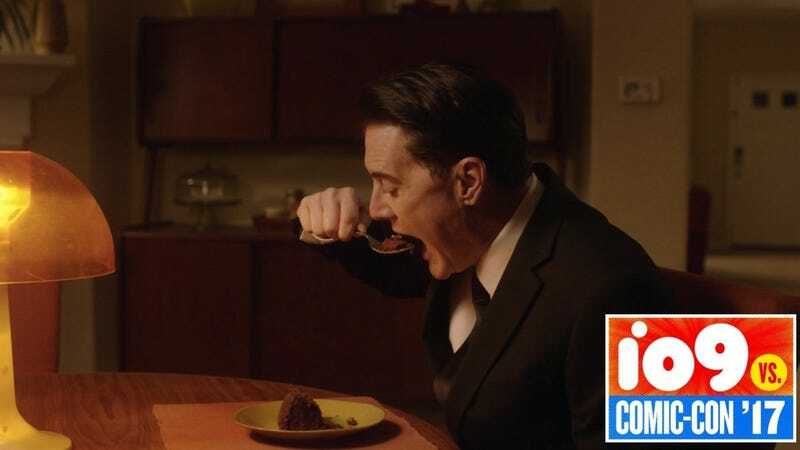 MacLachlan got the ball rolling with Dougie’s rallying cry from his slot-machine winning spree in episodes three and four: “Helllooooooo!” But the ball didn’t roll too far; there were no big reveals or teasers or anything to hint at what’s to come in the second half of the season. But though they may be just as perplexed as the audience by what exactly is happening on the show, they all had nothing but glowing words to share about Lynch and the Twin Peaks experience. Though Lynch himself wasn’t there in person—seriously, did anyone think he would be?—Lynch sent ahead a greeting that was just as eccentric as you would expect, punctuated with static, non sequiturs, and weirdness happening just off camera. One of the most surprising new faces in the cast is Lillard (his take on Lynch: “He has this incredible sense of joy about him... he is a fantastic human being”), who’s probably best-known for his roles in Scream and comedies like She’s All That and Scooby-Doo. In Twin Peaks, however, he plays a very complex character (a high-school principal, accused murderer, and inter-dimensional traveler) who has one of the show’s most emotionally wrenching moments ever. One bit of news that did emerge from the panel was that Twin Peaks: The Return will move to an earlier time slot on Showtime—8:00 pm ET—starting August 6. Episode 11 airs this Sunday, and you can trust us when we say have absolutely no idea what’s going to happen.